"Thanks for quiet rooms and great rates! Our children love the country setting and chicken strips in the restaurant." —Jennifer R.
"We appreciate the clean rooms and nice conversation on Friday." —Linda and Steve G, Wayne N.J.
"The chain hotels in the local cities near Elk Mountain remind us of the busy, fast-paced lives we seek respite from on our weekends. Your relaxed country setting is just what we like. The local patrons in the tavern were just so nice. We'll see you for our June mountain bike trip with our friends." —Tom and Sarah, King of Prussia. "You Orazzi's go the extra mile when it comes to being friendly. My coworkers and I agree; that's rare these days." 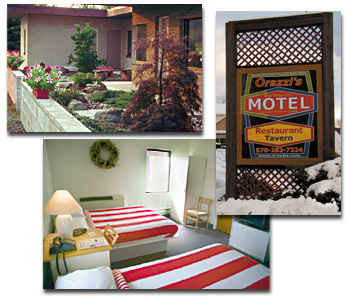 Cozy, Warm, Clean, Family-Friendly Lodging. You want a clean, trusty, cozy room at a great rate, right? Inn-Keepers Dante and Dorothy Orazzi deliver! They work hard to make your stay comfortable. Our rooms are well cared for and maintained—the same kind of rooms we look for when we travel. Our family members personally clean and maintain each room: you can be sure you're getting great accomodations. Make no mistake! This is not your slow chain hotel internet. Our Internet is FAST! Bring your laptops. Dining room also has WiFi. Perfect for weekday lodging: Get your groove on with some work and some play! Quiet, Low-Stress Atmosphere close to fun. Family Restaurant and Tavern Next Door with Cozy Stone Fireplace where you'll meet nice folks. Ski Packages Coming this week! Discount Lift Tickets are Now Available with or without lodging! We'll keep your email secure, private, and will never share it. If you email us, we will email or call you back during 9 to 5 business hours. Depending on restaurant prep demands you may reach us between 9am to 5pm at 570-282-7224; we just can't promise someone is available to take calls during these hours due to food preparation demands.